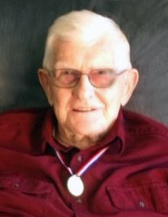 Owen E. O’Neill, 96, Mandan, died March 20, 2019 at Missouri Slope Lutheran Care Center, Bismarck, where he had resided for the past 5 years. Mass of Christian burial will be held at 1:30 pm on Wednesday, March 27, 2019 at St. Joseph Catholic Church, Mandan, with Rev. Joshua Walz celebrating. Burial will be at the North Dakota Veterans Cemetery with full military honors. Visitation will be held from 6 to 8 pm on Tuesday, March 26, 2019 at Buehler-Larson Funeral Home, Mandan, with a parish rosary/vigil at 7 pm. Visitation will continue one hour prior to the service at the church on Wednesday. Owen was born May 21, 1922 to Daniel and Henrietta (Gager) O’Neill in Odense, ND where his family ran a store and the post office. His family moved a hotel building west of Fort Rice where they established their family farm. Owen grew up there with his 8 siblings. 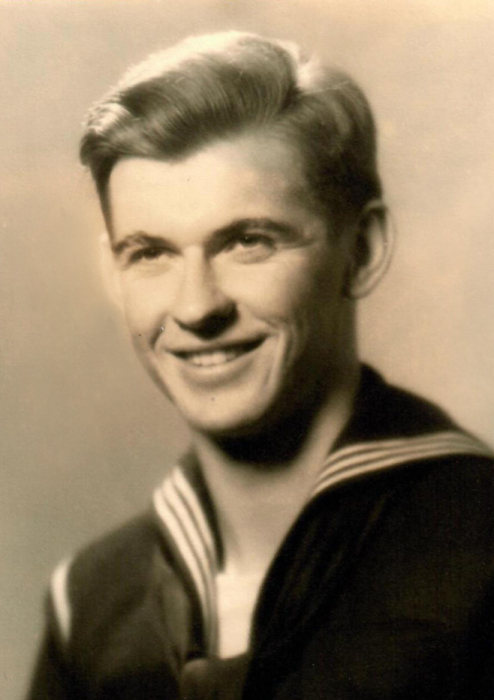 In September 1942 he enlisted in the US Navy where he proudly served in submarine service in Pacific Theater. He was on 7 of 8 war patrols aboard USS PomPon SS267. Owen was aboard the USS Proteus when Japanese submarine J-14, a seaplane carrying sub, surrendered. Owen was a member of the prize crew that sailed the J-14 into Tokyo Bay and was present during the formal surrender of Japanese forces to the allied powers. On June 11, 1946 Owen married Rosella “Sally” Kolberg. They made their home in Mandan where they raised their three sons. Owen worked throughout the US as an electrician and was a member of the IBEW Local 714. He worked at the refinery, missile silo, power plant, and pumping station. Owen enjoyed square dancing, playing cards, traveling the country, rock hunting and lapidary which is forming stones into decorative items. In his later years, Owen enjoyed driving his yellow “hot rod” golf cart around the Lakewood area and south east Mandan. He was great at telling a story or joke, always with a smile and a sly wink. A wonderful father, grandfather, and great-grandfather, he will be missed by all who knew and loved him. Blessed to have shared his life are three sons and two daughters-in-law, Eugene (Linda) O’Neill, Mandan, Dennis O’Neill, Tuttle, and Patrick (Roxane) O’Neill, Moreno Valley, CA; one granddaughter, Erin (Arik) Moe; one great-grandson, Finnegan Moe; and many nieces and nephews. Owen was preceded in death by his wife, Sally, in 2007; his parents; and all of his siblings. Memorials are preferred to the North Dakota Veterans Cemetery.